The tools and technology at our disposal have made connecting with other people easier than ever. We can tweet from the train or blog from our living room and contribute our opinions and thoughts to individuals who share our interests and passions. However, all this expanded access is wasted if we squander our opportunities to make meaningful connections. There’s something about getting behind a screen that makes people behave differently than they would face-to-face. I’ve always found that the secret to successfully building a professional network online is to try and fight that tendency to be impersonal. Instead of selfishly trying to promote your brand or make connections, the key to effective networking is being generous. Generosity is something rarely associated with networking and that’s a real shame, because networking should be all about other people. The only way a meaningful connection can happen is if both parties feel equally acknowledged and valued. An unlikely medium for expressing generosity and making your networking personal is content marketing. This post will highlight a few ways that you can combine effective content with a generous attitude to expand and enhance your professional network. 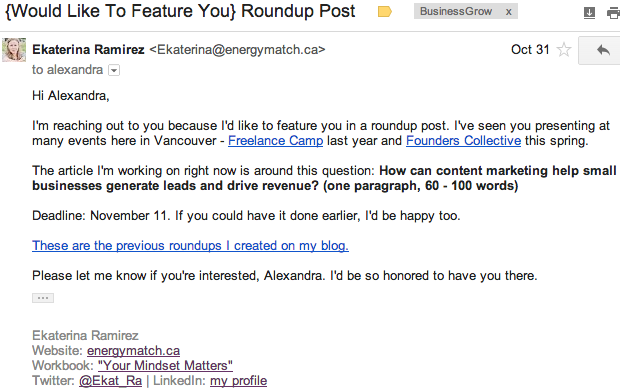 Round-up posts are a great way to use your content to extend generosity, create value for all parties involved and flesh out your editorial calendar. For those who don’t know, a round-up post is when you propose a single topic then reach out to multiple people to weigh in on their opinions, answers, thoughts or beliefs. Just in that description, one begins to get a sense of why round-up posts are great for extending a sense of collaboration and generosity. These posts, by definition lend weight and credence to the opinions of others. Sure you claim some degree of authorship, but really what you are offering is a platform for others in your field to voice their opinion and have their thoughts heard on a particular topic. Not only is the final outcome of a round-up post great for networking, but even the process of putting one of these posts together affords you a great networking opportunity. 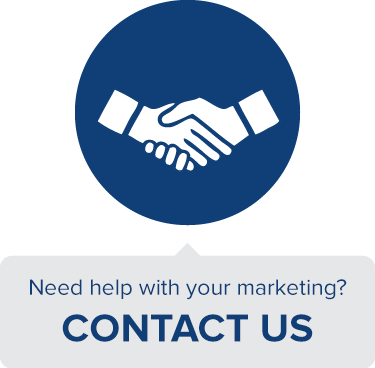 Typically, the creation of a round-up post begins by deciding on a topic, then searching the web for the most relevant experts in the field or individuals that already comprise your network. Once you have a satisfactory number of contributors, the next step is to set up the post. There are many right ways to do this, but one thing they all have in common is that you should be generous and consistent in the amount of credit you give and the number of links you direct back to your contributors. The better the article is for those involved, the more likely they are to share it with their audience online and drive greater visibility to the piece of content. @Mention @ShannnonB thanks for inviting me to contribute! it's an honour! A fantastic example of this process is Mention’s round-up post on social listening (which I was featured in too!). I certainly linked to the post when it was published, and so did everyone else who was mentioned. Sure, we may not have had any allegiance to Mention before, but now that we had been featured we certainly did have a stronger tie with the company and its staff. Not only does this kind of post strengthen your connection to multiple industry influencers, it also allows you to leverage their combined followings and set your content up for success across social media. Another great way to use generosity to expand your professional network is to write a book review. It is now easier than ever to publish and promote a book, which has lead to an increasing amount of bloggers and other professionals using a book as a vehicle to get their name out there and better establish their brand. Chances are, if someone is influential online, they have written at least one book, and another is likely on the way. In most cases, the people in your industry who are writing books are exactly the type of people you want to be connecting with, so what better way to start reaching out than to use your blog as a platform to review their book? Not only will reading books written by industry thought leaders be a valuable learning tool, but taking the time and effort to write a thoughtful review might be a great way to open up a new professional relationship or strengthen an existing one since you’re helping them increase the visibility of their book and ideally driving more sales for the author. Given how beneficial they are, book reviews are an often underutilized tactic for building your network. This gives a potential book reviewer the added advantage of providing quality and original content for their audience, while deepening relationships with others in their industry. However, book reviews will only work as an effective content marketing and networking tool if you choose the right book to review. When making this decision be sure to select a book your audience might enjoy as well as an author whom you might have a chance of connecting with in the future. Sure, Seth Godin’s or Tony Robbin’s latest book might be relevant to review, but there is a higher chance that authors at their level will not take note of your review since they are widely successful authors that have had many books published under their bylines. The ideal candidate for a book review is likely an author who is well-regarded but also at an earlier stage of their career, which will make it easier for your review to stand out and establish an opportunity to connect with them. There are a lot of authors out there in this exact position and you can be sure that they will notice your coverage if you take the right approach. Before writing the post, consider letting the author know that you are planning on reviewing their book. This will serve as a great opener and also give him/her a chance to explore your other work. Similar to the point made about the round-up posts, writing a book review can be a good tactic for making a connection with someone who might have been professionally out of your reach otherwise. Beyond a pure review of a book, another option could be to simply write an article focusing on a particular topic that references an author’s book. A piece that references the book heavily offers all the advantages of a book review, but is likely a more enjoyable read for your audience as compared to a pure book review repeatedly praising a particular piece of work. 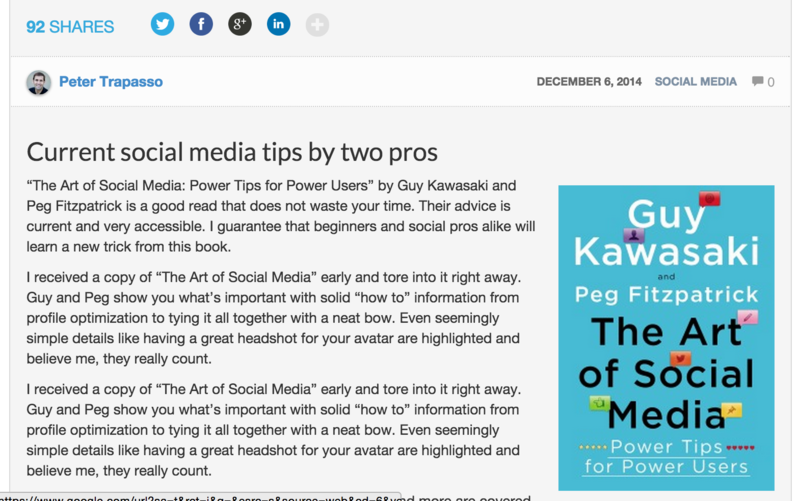 One blogger who does a great job of writing reference pieces like this is my friend Dorie Clark. As you can see in this piece she wrote for Forbes, Clark places the book Hooked: How to Create Habit-Forming Products at the center of her article. Featuring the work so prominently implicitly tells the reader that this is a book worth reading, while also providing a stronger context for the use of the insights found in the author’s work. Depending on the circumstances, either a book review or reference piece can be the appropriate medium. What makes both of these methods so effective for expanding your network is the common sense of generosity and goodwill they extend to other thought leaders within your industry. One of the backbones of traditional journalism is the interview, yet so many newer writers don’t seem to take full advantage of this tried and true technique. Not only can a one-on-one interview provide great content for your readers and elicit new insights on a topic, the act of pursuing and engaging with a potential interviewee can present a great networking opportunity. Of all the content networking methods mentioned in this post, the interview is the most personal and also the most time consuming, so it will be necessary to choose your subject carefully. Interviews are a great tool for establishing a new relationship, since it’s often an effective opening request to grab a potential connection’s attention. Interviews can also be a powerful technique for enhancing an existing relationship with someone in your network. 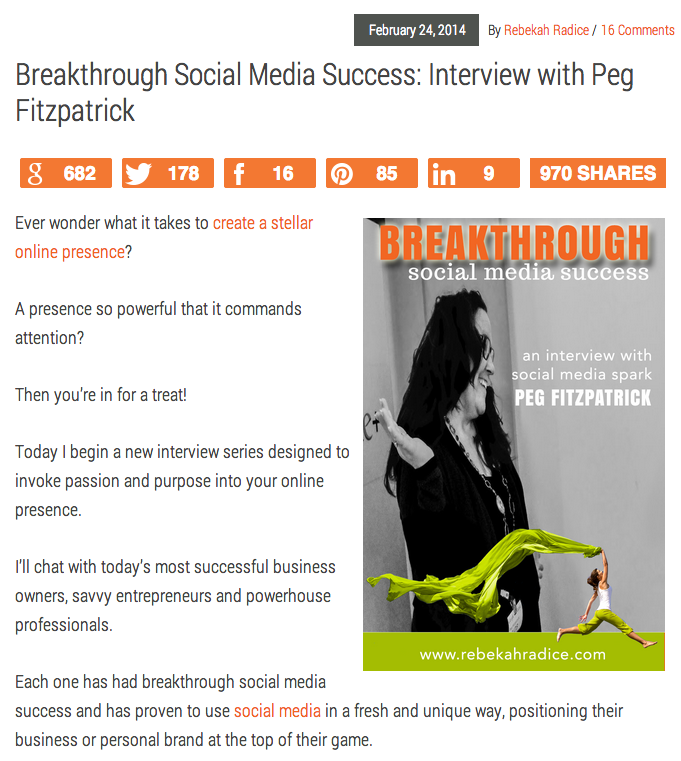 A great example of an interview post enhancing a previous connection is this fantastic interview of Peg Fitzpatrick by Rebekah Radice. Looking at the level of candor (not to mention the picture of the two together) it is clear that they have a strong existing relationship. However, this only adds to the quality of the interview, and the process of engaging in this quality dialogue likely only enhanced their friendship. The format of the interview, as well as the way you engage your subject, is entirely up to you. Although speaking over the phone or in person is likely to elicit the most natural conversation, this is not only the option. Luckily, even an interview over email or another messaging service can be woven into a compelling narrative with proper planning and formatting. Regardless of how you conduct and present the interview, if you choose the right subject and ask the right questions you will likely produce content that benefits your audience as well as the audience of the person being interviewed. Looking through the comments section of Rebekah’s interview of Peg, there is an uncanny amount of enthusiasm. One noteworthy element of all the praise this post received was that commenters not only commended the advice given, but they also expressed their delight in seeing two people they respected and admired interacting with one another. Reactions like the one above speak to the power of interview posts to create a quality connection with your audience and other members of your network, and they also serve as a testament to the fact that thoughtful content marketing, combined with generosity and outreach, can help expand your professional network while simultaneously enhancing your online reputation. 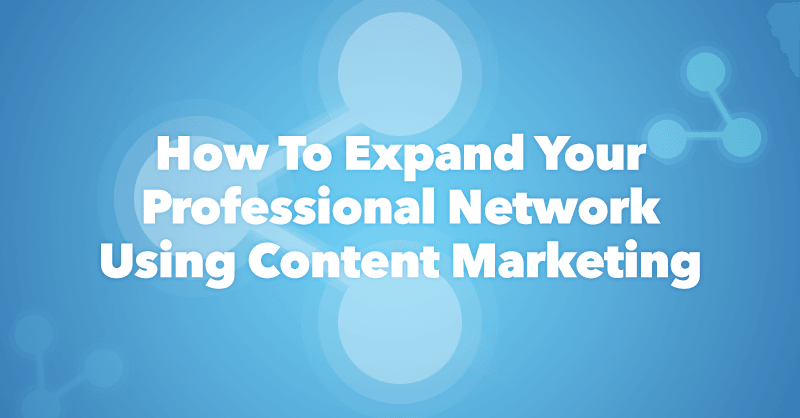 Have you used content marketing to expand your professional network? If so, which methods did you find most effective? Anything you think I missed? Let me know in the comments below, and as always, thanks for reading!